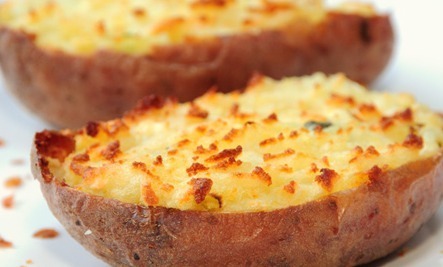 Baked potato: it’s delicious, and loaded with incredible health benefits. Potatoes are a complex carb. They’re rich in Vitamin B complex, reduce stress and lower blood pressure. Just don’t order French fries! Grilled cheese on whole wheat bread: gives you carbs plus calcium, a mood-bettering, energizing combination. Apple and peanut butter. A great combo of carbs and protein: satisfying, energy-boosting and nourishing for the brain. The perfect comfort food! A cup of buckwheat noodles tossed in pesto and topped with stir-fried veggies. Low in calories, they give you carbohydrates and proteins. Besides, they fill you up nicely and taste great. A bowl of spinach soup or, if you want to make a meal of it, whole wheat pasta baked with spinach. Spinach is rich in serotonin, the feel-good neurotransmitter. And of course, spinach lavishes you with vital minerals that restore energy levels, too. A banana. Loaded with potassium and the B complex vitamins, bananas are a proven anti-sadness fruit. They calm down your heartbeat and control blood pressure, thus steadying you after an unpleasant episode. A delicious way to enjoy bananas is to slice them in roundels, squeeze some lemon juice on them, and toss them in a little sea salt. Bonus: citrus increases energy and feels very refreshing! Walnuts: munching on walnuts feels very comforting, as we all know. The great thing is, they are known to nurture the brain, and an Arizona State University Study shows the Omega-3 fatty acids in them make you feel happier. Of course there are foods to avoid when you’re angry. Do take a few minutes to look up this list.